Winter craft date? It's the perfect time of year to gather inside, in the warmth, with a coffee or cocoa and a good friend and make something awesome. My friend, Renee, and I were determined to add to our repetoire of seasonal crafts after the burlap placemat success. 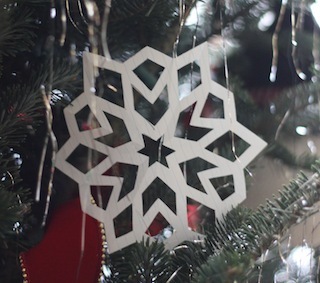 We decided to go simple, or so we thought, and make the paper snowflakes. We had a variety of papers, and I ended up using a looseleaf pack that I've had for a very long time because of the thin, durable weight to the paper. And, the white tone was just a bit softer than our other choices. So grab a stack of paper, sharp scissors, good lighting, and a pal. Lots of great patterns around the interwebs will surprise and delight you, like the ones we used as inspiration: Wee Birdy, these great ideas, and you can even find paper snowflake patterns based on the new movie, Frozen (pinned for my girls). Folding the six-point pattern takes a little practice to get all the segments equal, but it it amazing the variety of snowflake you can create. Originally Renee and I were thinking that we'd put these together in a chandelier-type arrangement. Can you imagine cascades of intricate snowflakes floating down? Renee opted to display her snowflakes against her gorgeous red walls in the dining room. Fabulous contrasts! Honestly, mine sat in a pile for a while, waiting for me to have time and inspiration to make something. And then I started making more and more of them of various sizes. We have two trees in our house - our freshly cut and our (now duct-taped) artificial. The fresh tree has balls and ribbon and my favorite loose tinsel. It needed a little something extra. Spread throughout the limbs now are dozens of paper snowflakes. 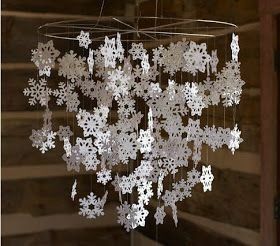 If you want a simple craft that will make you feel way more talented than you might be feeling on any particular day, cut some snowflakes. They can be used in wrapping, garlands, chandeliers, and in my opinion as awesome ornaments. Big hugs and thanks for Renee for the motivation to make these! Can't wait to see what we'll work up for spring. Also, Kim of Design Life Kids and I will be showing off our long-distance Craft Date soon! If you wanna make something and need a buddy, let me know. It's always more fun to do create with a pal. Happy weekend, lovelies! I'll be writing my arm off and sending Christmas cards! Best to you and yours.